Online bingo sites, such as Gossip Bingo, come in all sorts of shapes, sizes, outfits, disguises and colours. Jokes aside, that’s fantastic news for players. It means you can up and leave a Bingo site whenever you want. You don’t need to sit elbow to elbow with Judy from down the road, swearing under your breath – simply open another tab and head over to ZoomBingo to see what other sites take your fancy. At Gossip Bingo, people tend to stick around, for good reason too. With the friendly, welcoming online environment available at Gossip Bingo, people are happy with the community, not just the site. You’re more likely to have to pry them from their keyboard than catch them on Lucky Pants. Launched in 2010 and reworked with a bit of Botox in 2014, the Dragonfish site is definitely doing something right. With hot pink design and bold colours, the site appears show a spin off of Disney Pixar’s ‘Up’, rather than the usual ‘Mum’s kitchen cream’ that’s usually present on big time sites – Have a look at the background to see what I’m on about. New player offers and free online bingo are some of the strong points when it comes to Gossip Bingo. We’ve handpicked our favourite two available right now, just for you. What’s even better is that you can use them in conjunction with each other. You can have TWO new player bonuses for the price of one. Now that’s good. Want a go at Gossip Bingo but don’t fancy using your well earned (or won) cash to give the Gossip a go? Not an issue. With Gossip Bingo, you’ll have more FREE bingo than you can shake a stick at. 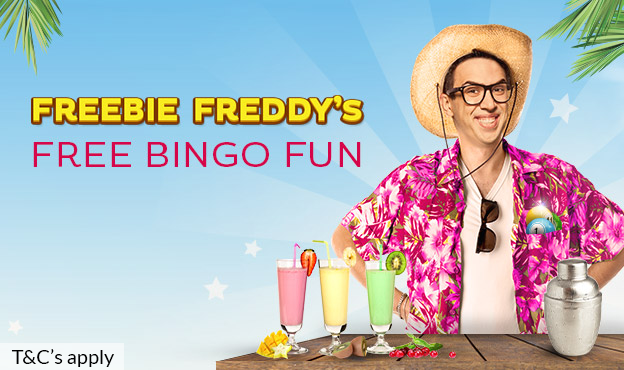 Freebie Freddy (the guy looking like he’s just been voted out of ‘I’m a Celeb’) is waiting to introduce you to loads of brand new games that you can play absolutely free. With a chance to win up to £26,000 every month, we can even forgive that shirt. Your new player bonus comes in the form of access to the first of the free bingo rooms – The Biggie Room. You’ll be free to play for 3 whole days, no deposit needed. You’ll be chasing £50 jackpots, absolutely free. That’ll wipe the smile off of Flamboyant Freddie’s face. The Biggie: Claim £50 jackpots in The Biggie! Unlock this room by signing up as a new customer for 3 whole days or by depositing £10 any time for two further whole days of play. The Grand: You can unlock this room with just £20 for two whole days of free bingo fun. With the chance to win £100 prizes all day, it might be worth a shout using a little more on your first deposit! The Ultra: You can unlock this room with a deposit of £30 for two whole days in one of the the greatest free bingo rooms on offer. There’s tons of £250 jackpots up for grabs when you play. The Supreme: It’s supreme for a reason – home to the biggest free bingo jackpots available on Gossip Bingo. Enter The Supreme when you deposit £50 and play for two days to win amazing £500 prizes! We love getting more money for less and Gossip Bingo does not disappoint. 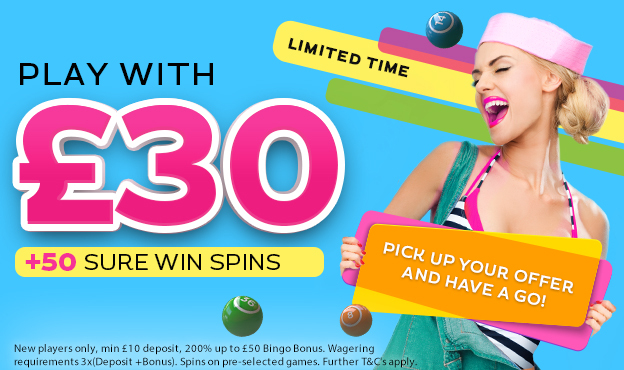 You’ll even get 50 sure win free spins for your trouble – that’s too much if anything! To claim simply hit the ‘Claim Now’ button at the top of the page, click one of the featured images above, or if you’re feeling particularly lazy… Click Here. Gossip Bingo is home to a huge number of games, as you’d expect from a bingo site. They’re all ready and waiting for whenever you fancy hitting the balls, slots or casino games. Bingo options may be lacking a little with just your usual 90 and 75 ball present, but plenty of other games are available to switch it up and alleviate boredom. With 100+ casino and slot games, you’ll find something that takes your fancy! Under the slots tab, you’ll find other bingo games (not as bad as it first seemed) with Love Island Slingo and Rio Bingo to name only a couple. Slots and casino games cover huge amounts with everything from ‘Snow Leopard’ and ‘Pay of the Dead’ to ‘Spellcast’ and ‘888 Dragons’. You’re more than welcome to try your luck at loads of other bits and pieces, if you’re not feeling the bingo rooms. 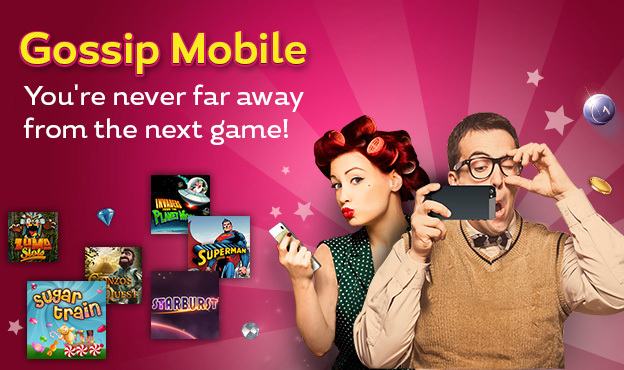 With Gossip Bingo’s mobile app, Gossip Mobile, you’ll never far away from the next game! Simply visit GossipBingo.com from your mobile or tablet or search for the bingo site itself by tapping ‘Gossip Bingo’ into the App Store to play on iPhone, iPod or iPad. An Android App is on the way, but you’re still more than welcome to play online through your device’s browser. Gossip Bingo: Gossip Mobile – You’re Never Far Away from the Next Game! A dedicated bingo section allows you to plug away at 90 and 75 ball bingo from anywhere in the world to get involved with the Daily Jackpot and free bingo rooms. Slots are given their own separate tab with a huge selection to choose from. Whether it’s Rainbow Riches, Starburst or even Superman – there’s something for everyone on mobile at Gossip Bingo’s Gossip Mobile. Wagering at Gossip Bingo is actually pretty reasonable. When it comes to new customer offers, sites tend to have a few sneaky bits and pieces lingering around. But everything seems A-OK with Gossip. Our information written at the time of posting may also have changed, so be sure to read through the terms and conditions thoroughly. Please note that bonuses that do not meet the wagering requirement will be forfeited. Wagering contribution depends on a game to game basis and the terms and conditions of the site should be consulted before play. There are numerous ways and means to deposit and withdraw with Gossip Bingo to make it as painless as possible for you to manage your money. A maximum of 3 withdrawals per day are permitted. Processing times of between 4 and 7 days for transactions to complete.